The Transitional Stick, or "T-Stick" for short. The concept was suggested to me by Helen Wilson, triple Gold Medalliast at the 2008 Greenland Kayaking Championships. Designed as a tool for progressing from a Standard Greenland Roll and the Butterfly Roll to a Norsaq Roll and then a Hand Roll, the T-Stick is roughly 50% longer than a normal Norsaq or Rolling Stick. The two ends are similar in size to the Norsaq. The middle section, where the paddler holds it, is approximately 2.25" to 2.5" in width and oval in cross section. Our Rolling Sticks are usually up to 18" in length whereas the T-Sticks come in at about 26", providing much more buoyancy as you transition towards your Rolling Stick/ Norsaq rolls and hand rolls. 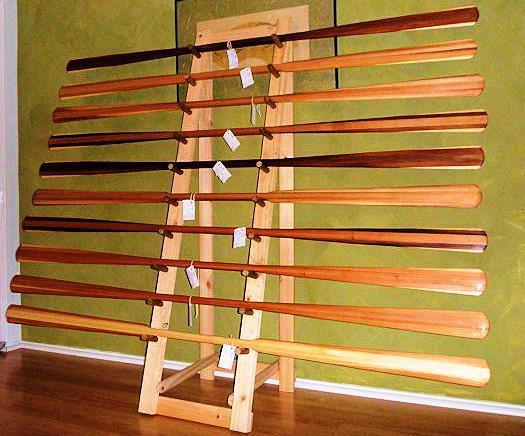 These T-Sticks are part of an article in a older issue of Sea Kayaker Magazine that Helen did on rolling. They are also mentioned and shown in Helen Wilson's new DVD, "Simplifying The Roll".